Trio of swimmers notch 10 top-eight finishes at 2018 swim championships in Gresham. Over the past weekend, three members of the Madras Swim Team competed at the 2018 Oregon Swimming Arena Long Course Championships in Gresham, and the results did not disappoint. Without the benefit of training in a 50-meter pool on a regular basis, the trio of Lexi Williams, Elli Williams and Julian Hollingshead notched 10 top-eight swims out of a combined 17 entries. Top-eight finishers score team points and earn individual medals. Last February, Lexi posted four individual victories in the 25-yard short course state championships as an 11-year-old. 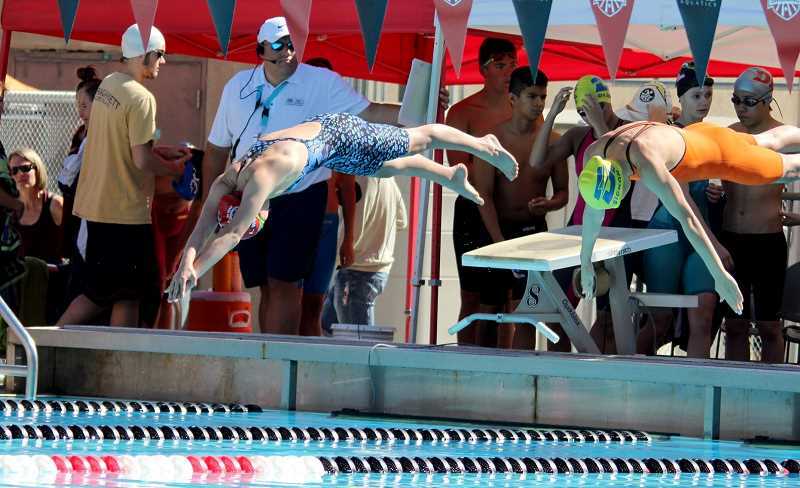 She knew competition would be tough as a 12-year-old; nonetheless, she notched a victory in the 50 freestyle, and, collected second-place finishes in the 100 and 200 freestyle, respectively. Head coach Tim Nelson noted that the victor in the 100 freestyle, Stephanie Lee, actually turned 13 during the meet, but by rule, the age for the meet is the youth's age on the first day. "There are six or so girls who have competed all spring and summer against each other, and they feed off each other. It is exciting to watch," said Nelson. Lexi also finished fourth in the 400 free, displaying distance ability. Lexi will next join some of her Oregon competitors on an all-star team representing Oregon Swimming in the Western Zone meet next week in Roseville, California. Julian, 13, also scored in four events while dropping significant time in the 50, 100, and 200 freestyle and the 100 breaststroke. "Julian stepped up big time. It was nice to see big smiles from him; his work paid off," noted MST assistant coach Sara Nelson. Julian also posted big drops in the 100 butterfly and 400 meter freestyle. Both coaches pointed out that Julian and Lexi's fields of competition were very tough. "Julian has scored in three state meets and Lexi four. Coaches and swimmers definitely know who they are and where they are from," according to Sara Nelson. Not to be denied the spotlight, 14-year-old big sister to Lexi, Elli Williams, made a name for herself smoking her seed times in the 50 and 100 freestyle, earning spots in the finals. In finals, seeded sixth from lane seven for the 50, Elli battled the field leading at one point, and hung on for an outstanding fourth place in a swift time of 28.71. She then backed it up on Saturday with a fifth-place finish in the 100 in 1:02.52. "Elli qualified for the maximum six events for state, up from one in February. She is extremely coachable and has a drive for the sport. She is one to watch out for this coming year as she enters high school," according to Tim Nelson. With the season winding down, coaches and swimmers look forward to the fall/winter short-course season. Practice will begin in early September for older swimmers and mid- to late September for younger and new swimmers. MST will host a meet Saturday, November 10th. Update information will be posted at macaquatic.com.